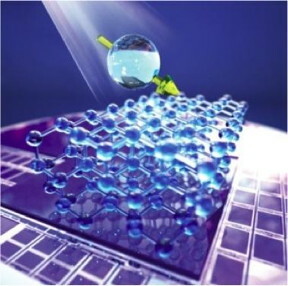 Light polarizes silicon nuclear spins within a silicon carbide chip. This image portrays the nuclear spin of one of the atoms shown in the full crystal lattice below. Citation: "Optical Polarization of Nuclear Spins in Silicon Carbine," by Abram L. Falk, Paul V. Klimov, Viktor Ivády, Krisztián Szász, David J. Christle, William F. Koehl, Ádám Gali, and David D. Awschalom, Physical Review Letters, 114, 247603 (2015), DOI: 10.1103. Published June 17, 2015. Funding and support: Air Force Office of Scientific Research, National Science Foundation, Knut & Alice Wallenberg Foundation, Hungarian Academy of Sciences, and Sweden's National Supercomputer Center.